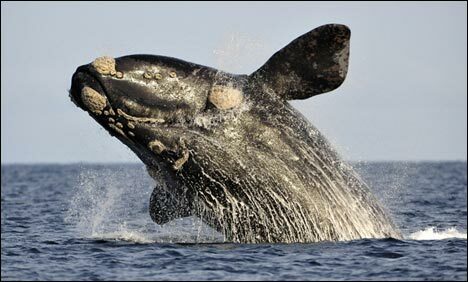 BOSTON: Efforts to protect the North Atlantic right whale have gone high-tech with the creation of an iPad/iPhone application that can warn mariners when they approach an area where the highly endangered mammals are congregating. The Whale Alert app, available for free download, uses global positioning system and other technology to send the latest data about right whale detections, overlaid on National Oceanic and Atmospheric Administration (NOAA) digital charts, to the user's device. "Right whales are an iconic species for those who live on the coast of Massachusetts and the Northeast U.S.," said Patrick Ramage, director at the International Fund for Animal Welfare in Yarmouth Port, Massachusetts. "In a region where for generations New Englanders have harnessed technology to find whales and kill them, now in the 21st century we are harnessing technology to find them and save them," Ramage said. "The whales are calling each other. We are eavesdropping into the social network of right whales living off the coast of Massachusetts," said Christopher Clark, director of the bioacoustics research program at Cornell University.